Eat fish people. No, don’t eat “fishpeople,” … nevermind. I am a strong proponent of eating salmon so this blog was created to figure out which is the best kind to eat. Priorities are 1) least toxins and 2) best fatty acid composition. 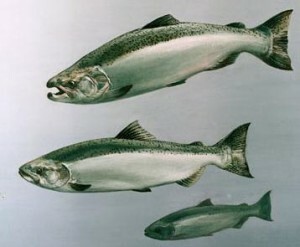 Farmed Atlantic salmon were sourced from North American commercial suppliers and included salmon from British Columbia, Chile, Maine, and Norway. They got 10 fish from 3 different suppliers in each region: 4 regions x 3 suppliers/region x 10 fish = 120 fish. Species: Farmed Atlantic (didn’t realize that was a species… this is one of those “a-duh” moments). Wild salmon were from suppliers in Alaska, British Columbia, and Washington for a total of 6 batches of 10 fish. Species: chum & coho. Co, cobalt; Cu, copper; Sr, strontium; Cd, cadmium; Pb, lead; U, uranium; As, arsenic; MeHg, methylmercury. The authors noted some statistically significant differences in cobalt, copper, cadmium (all modestly higher in wild salmon), and the nontoxic “organic” arsenic (higher in farmed salmon), but while those differences may be significant statistically, they don’t look significant physiologically. (if the authors wanted to make the differences look bigger, perhaps they should have opted for a linear ordinate; or maybe they just wanted to squeeze everything in one figure instead). 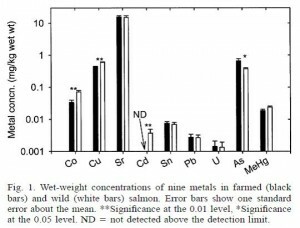 Interestingly, similar levels of these metals were found regardless of where the salmon came from. I would’ve imagined a Farmed Atlantic salmon from Norway would be vastly different than a Farmed Atlantic from British Columbia. Guess not. Fortunately, salmon is a relatively “clean” fish, so it doesn’t really matter. Oddly, the authors noted that wild salmon were longer than Farmed Atlantic, but mercury content didn’t correlate with length, only body size (fatness? muscularity? weird). Farmed Atlantic and wild (Coho & Chum) salmon were equivalent and well beneath both the FDA and the far more stringent EPA’s limits. On a side note, I learned that the FDA allows a higher amount of contaminants because they are talking about exposure to each contaminant individually. The EPA is stricter because they are taking into consideration the fact that we are exposed to multiple contaminants simultaneously (“toxic world,” and all that jazz). For example, you would be safe consuming a fish with 76.0 mg/kg inorganic arsenic if that were the only toxin to which you were exposed. But when multiple toxins are present, as they most likely are in our diet, the cutoff for inorganic arsenic is set at 0.002 mg/kg. The FDA allows 38,000 times more inorganic arsenic than the EPA; that seems grievously negligent but in reality, the amount in commercial fish is significantly lower. It’s like saying you must be at least 2 inches tall, by the EPA’s standards, or 5 inches tall, by the FDA’s standards, to go on a rollercoaster ride. One last note: the limit for methylmercury consumption is ~0.4 ug/kg/d, which is approximately 28 ug/d (for a 70 kg or 154 lb person). Even the most toxic salmon has methylmercury <100 ug/kg, meaning you can safely eat ~300 grams (10 ounces or about 3 servings) of salmon per day. 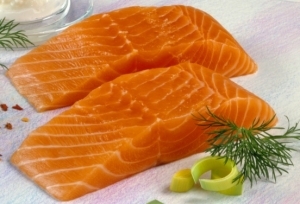 Farmed Atlantic salmon: 8 major commercial suppliers. Side note: even if your exact city or region isn’t on this list, I suspect the conclusions can be reasonably applied to just about everywhere. This figure is very busy. Concentration of contaminants in Farmed (red), supermarket Farmed Atlantic fillets (yellow), and wild (green) salmon. Focus on the cities listed at the bottom: the ones toward the left (Europe) are ultra-toxic; the ones on the right (Pacific [Alaska]) are the most safe. Conclusion from these data: Wild Pacific is safe, Farmed Atlantic is intermediate, and anything European is toxic. Avoid Scottish salmon like the plague. And microwave popcorn. Figure 5. 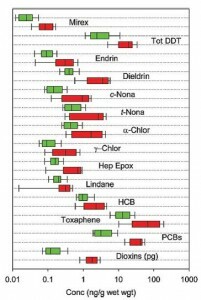 Contaminants in fish feed. European fish food is bunk (red bars). 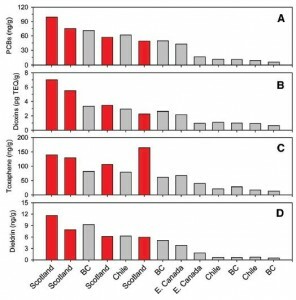 Pacific (BC British Columbia, Chile) and Atlantic (E. Canada) fish foods are OK (both in gray bars). 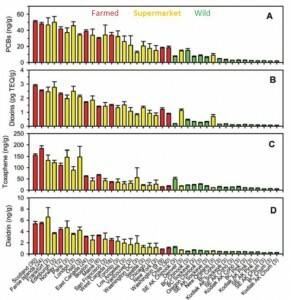 WRT contaminants (Hites study): wild Pacific (Alaska and British Columbia, also Chilean) is good, supermarket Farmed Atlantic fillets are OK, and European is bad. Total EPA + DHA: 1st place goes to farmed Atlantic: 1,966 mg EPA + DHA per 100 grams. On average, farmed salmon contains more EPA + DHA than wild salmon. And there were even species-differences: Alaskan Silver native coho (1,876 mg) had much higher EPA + DHA than Alaskan King Chinook (1,150 mg). Conclusions: WRT contaminants, wild Pacific seems best, farmed Atlantic is OK, and European is bad. WRT EPA + DHA, Farmed Atlantic and silver Alaska native coho were best and wild Pacific was the lowest. IMHO the benefits of DHA & EPA outweigh the malefits of contaminants because the dose of EPA + DHA in a serving of salmon is sufficient to reap many of the benefits of EPA & DHA, while the dose of contaminants is too low to cause harm. Therefore I’m going to stick with Farmed Atlantic. OOTH if silver Alaska native coho is similar to Kodiak salmon (which I think it is), then it has the lowest contaminants as per the Hites study and 2nd highest EPA DHA as per nutritiondata. This entry was posted in Advanced nutrition, Fish. Bookmark the permalink.